SKOHRboard: College Basketball Started Too! The end of College Football also hearkens the beginning of College Basketball's relevance. As you might have guessed, the #1 team in the country is Duke. That was until last night when they were beaten by an unranked Florida State team that has made a habit of upsetting Duke's #1 ranked teams. The picture above crystallizes perfectly why so many people don't like Duke. Even the little kid fans, whose parent's have obviously indoctrinated them into the Duke way of thinking, cry when they lose. This kid might as well personify every Duke starting Point Guard from the early 90's to infinity. Which if you couldn't tell means that I'll be routing for the underdogs here. Let's go SDSU! What's happening in College Basketball this year. 4 teams are still undefeated Ohio State, Kansas, Syracuse and San Diego State. The Big East is VERY talented with 7 teams in the Top 20. 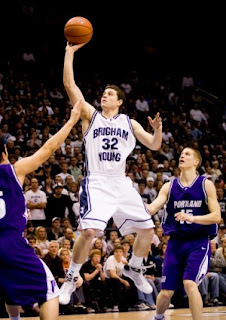 The top scorer in the country is a guy named Jimmer Fredette from BYU. The Marcus brothers are a very good tandem for Kansas. Oregon is set to unveil the new quarter billion dollar Matthew Knight Arena tonight. NBA draft notables; Kyrie Irving PG Duke, Harrison Barnes G UNC, Terrence Jones F Kentucky, Perry Jones PF Baylor, Jared Sullinger PF Ohio State, Enes Kanter PF Kentucky. There is obviously a lot more going on and a lot more time to play before March Madness but this should be a pretty good top line to start with. Of course I'm just getting into it so if I missed anything that is a huge glaring omission please let me know in the comments.